“WORLD’S GREATEST!...” NATIONWIDE TELEVISION SERIES FILMS WORKHOLDING SEGMENT IN ROYAL MACHINE PLANT. CHUCKS ON MACHINING CENTERS! WHY NOT? KEYS TO A SUCCESSFUL AUTOMATION AND WORKHOLDING INSTALLATION! NOW YOU CAN EASILY VIEW ROYAL MACHINE & TOOL'S NATIONALLY TELEVISED SEGMENT AS ONE OF THE "WORLD'S GREATEST!" 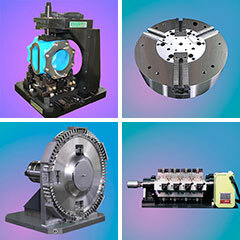 IN THE DESIGN & DEVELOPMENT OF WORKHOLDING PRODUCTS. ROYAL MACHINE & TOOL CORPORATION SELECTED BY NATIONWIDE TELEVISION SERIES AS ONE OF THE "WORLD'S GREATEST!..." IN THE DESIGN & BUILDING OF WORKHOLDING PRODUCTS! NEW ROYAL MACHINE & TOOL UNIVERSAL MODULAR FIXTURE REDUCES FIXTURE COSTS AND CHANGEOVER TIME BY ELIMINATING CUSTOM WORK NESTS AND TOP JAWS. New Royal Machine Chain Fixture Designed For Small & Medium Size Machine Shops. NEW ROYAL MACHINE QUAD VERTICAL CHUCKING FIXTURE WITH NEWLY PATENTED THREAD BEARING DESIGN ENABLES INSTANT REPAIRING OF DAMAGED SCREWS OR BUSHINGS! NEWLY PATENTED ROYAL MACHINE & TOOL ADJUSTABLE CARTRIDGE JAW IMPROVES ACCURACY & GRIPPING FORCE...PROVIDES FASTER, EASIER JAW REPAIRS...GREATLY REDUCES ON SITE DOWNTIME! REDESIGNED ROYAL MACHINE MANUAL INDEX CHUCK SERIES IMPROVES OVERALL QUALITY, MAINTENANCE ACCESS & EASE OF MANUFACTURING! ROYAL MACHINE & TOOL DESIGNS & MANUFACTURES CUSTOMIZED RIGHT ANGLE & TABLE FIXTURE PLATES UP TO 86" X 90"! ROYAL MACHINE & TOOL SPECIAL "C” FRAME FIXTURE REDUCES OVERALL MANUNUFACTURING TIME THROUGH LESSER HANDLING AND CONCENTRATION OF MACHINING OPERATIONS! ROYAL MACHINE & TOOL CORPORATION CELEBRATES 65TH ANNIVERSARY IN PROVIDING WORKHOLDING SERVICES AND TECHNOLOGY!